Please call owner Michael at 210-744-9061 or Email him at Micwilso10@gmail.com . Boat Location: Corpus Christi, Texas. 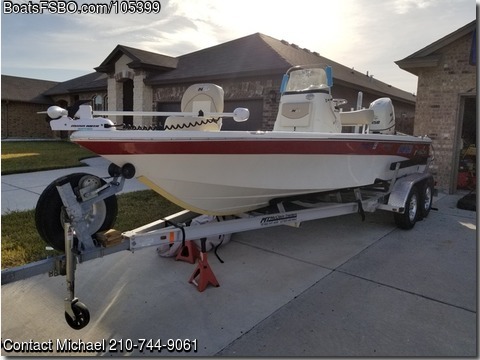 Power Pole, Lowrance GPS/Depth/Fishfinder, Infinity AM/FM Bluetooth Stereo, Custom Interior LED Lights, Hydraulic Steering, Swim Step with Custom Ladder, Trim Tabs, Full Gauges, Mooring Cover New in 2018, Bimini Top, 2 Live Wells, Catch Well, Trolling Motor with Remote, Rod Holders, Lots of Storage including 20 Pole Storage, Leaning Post, Four Batteries, 2-Bank Onboard Charger, 20 Hours on Motor, Stainless Steel Prop, Power Tilt & Trim, Bilge Pump, Coast Guard Package, 2 Anchors, and a Matching Aluminum Trailer with Custom Wheels. This is an Original Owner Boat, and it has been Always Professionally Maintained. There is a lifetime warranty on the hull and a factory warranty good until March 2021 on the engine.